The Martha Stewart Party in NYC was full of surprises! From dresses made out of paper, trays of ice-cream, an ice sculpture dj booth, edible cups and named canapés, it was an amazing spectacle. One got a real Alice of Wonderland esque feel. 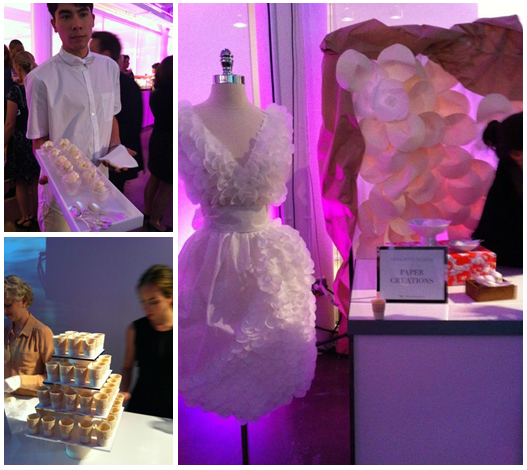 It was a brilliant way to celebrate the end of New York Bridal Week! New York Bridal Week is always an exciting time for food, fashion and fun. I can only imagine how wonderful it was to see Martha Stewart creations up-close. I am wondering about those paper wedding dresses.